The Oral-B Genius 8000 offers an easy and comprehensive brushing experience along with an intuitive accompanying app. While it doesn’t come cheap, it will meet the majority of your dental hygiene needs. The Oral-B Genius 8000 rechargeable toothbrush brings a professional-level clean into the privacy of your own home. The toothbrush offers six different cleaning modes and a light-up pressure sensor to prevent enamel damage. It’s Bluetooth-enabled with a comprehensive corresponding app to guide users to reach dental goals, and comes with a phone mount for easy app usability. The Oral-B Genius 8000 has the potential to revamp your brushing experience, but with a hefty retail price, it’s no small investment. To get an idea of whether the product is worth its sizable price, we tried it out for a week at home. We evaluated its performance, design, and functionality to determine if it will meet your oral care needs. The Genius 8000 fits light in the hand, travels well, and meets any imaginable brushing need. It has two operating buttons: one to power the device on and one to activate the brush head. The handle slides easily onto the charge base, which attaches to a hygienically-designed brush head storage case. The handle works with five available Oral-B brush heads. Three options come included: one for overall advanced brushing, one for whitening, and one for sensitive care. The smart travel case functions as a charger when traveling. Just plug the included black wall cord into the matching port at the bottom. There’s also a USB port so you can simultaneously charge a personal device. Setup requires a few steps but is ultimately straightforward. First, you attach the charging base to the brush head holder, then slip the handle easily onto the base. The smartphone mount attaches simply: place the suction against the mirror and lock the holder into place. To set up the app, turn on your phone’s Bluetooth, download the app from the Google Play or Apple App store, then follow the prompted instructions to sync your device. Make sure to leave enough time to do all three steps for a comprehensive first brush. The Genius 8000 fits lightly in the hand, travels well and meets any imaginable brushing need. The brush provides a firm clean with six setting options: Daily Clean, Pro Clean, 3D White, Gum Care, Sensitive and Tongue Cleaning. The currently enabled mode is indicated via an icon both on the brush handle and within the accompanying app. All typical cleaning modes offer a stellar clean, with the Gum Care and Tongue cleaning options effectively adding to overall mouth hygiene. Daily Clean provides an overall clean, with Pro Clean offering a firmer pressure and higher frequency. Sensitive offers gentler pressure, Gum Care pulsates to for a gum massage, 3D white focuses on polishing the teeth, and Tongue Cleaning provides steady pressure for direct tongue contact. We tried using the Daily Clean for everyday brushing, but found we preferred the more high-powered experience of the Deep Clean setting. Though we expected Whitening to feel markedly different than Daily Clean, it had a similar, maybe even slightly softer, pressure. The pulsing sensation of the Massage mode was effective for gum work. We found the Sensitive setting was noticeably but not hugely softer than Daily Clean and Whitening. The brush heads slightly impacted the experience: the 3D white brush head offered a somewhat firmer experience across Settings, while the Sensitive brush head offered a bit of a gentler one. For a dentist office-level clean, we recommend trying the Pro Clean mode. The accompanying app will also recommend settings and brush head pairings for specific dental goals. You can customize the color for your handle’s smart ring, which will turn red if it senses a level of pressure that can damage the teeth. For the full 8000 experience, you’ll want to mount your phone to the mirror and queue up the Oral-B app. We found that at full charge, the battery will last you about 12 days with 4 minutes of brushing per day. The Genius 8000’s corresponding Oral-B app completes the product experience. The product comes with a phone mount that allows easy app access while simultaneously brushing the teeth. Key features include Habit Assessment, which measures your brushing style and provides recommendations for adjustments to improve cleaning effectiveness. We were most taken with the app’s Position Detection tool. 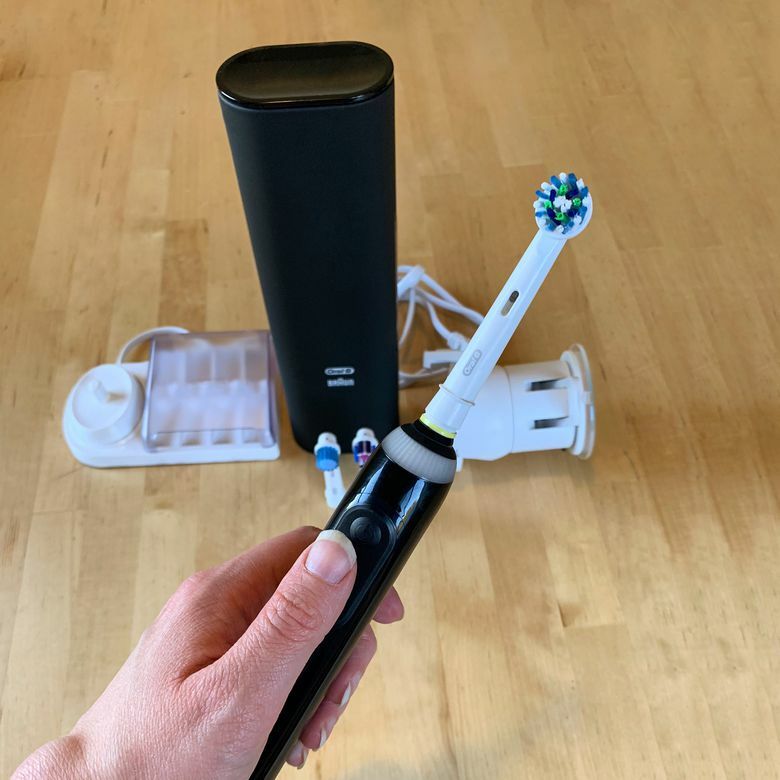 It uses your phone’s camera to perceive what areas of the mouth you are brushing and guides you to reach missed areas while you brush. The Genius 8000’s corresponding Oral-B app completes the product experience. The app also offers useful elements also available with the slightly less high-tech Oral-B 7000. You can select a Dental Care journey to receive targeted instructions toward reaching a specific dental goal. Options include Fresh Breath, Plaque Fighter, Whitening, Gum Protection, and Ortho care. Each journey offers two different length options. For example, you can undertake either a 4-week or 6-week Plaque Fighter experience. You can also set up in-app reminders for things like flossing and teeth cleaning. We found the app to be very intuitive, and the best way to make use of the toothbrush’s incredible smart features. Position Detection alone is worth the setup. Within one use, we found ourselves reaching brushing areas we didn’t realize we’d consistently been missing. With retail prices starting at just under $200, the Oral-B Genius 8000 is a significant purchase. If you’re working with a tight budget, you can find similar features with the cheaper Oral-B Pro 7000. However, most Bluetooth-enabled toothbrushes aren’t very budget-friendly. The 8000 costs less than any smart brushes offered by Philips. The cheapest Philips option—at $230—has only small variations in features from the Genius 8000. The Oral-B Genius 8000 rechargeable toothbrush brings a professional-level clean into the privacy of your own home. The Philips Sonicare DiamondClean Smart 9500 is comparable to the Oral-B Genius in price and functionality. It retails at $230, features multiple brush modes and intensities, pressure sensing, location detection an accompanying app and smart travel case. The Philips option will appeal more to those concerned with aesthetics: the handle is sleek and the charger is a stylish glass cup. Only the Oral-B option comes with a smartphone holder, so will appeal to those seeking a hands-free app experience. Want to take a look at some other options? See our guide to the best electric toothbrushes. Feel like you just left the dentist’s office every time you brush. The Oral-B Genius offers a close to professional-level clean with supportive accessories and app from the comfort of your own home. If you’re willing to take on the steep cost, you’ll be satisfied with the quality of your daily brush. Product Dimensions 1 x 1.25 x 9.5 in.